Anyone dyno the 17 crf250l yet? only one I've seen is about the same, perhaps a hair less than the 1st gen. Although between potential wheel/clutch slip, a new/tight engine, and possibly a dyno calibrated low, I wouldn't read into it too much. That's the only one I've been able to find as well. 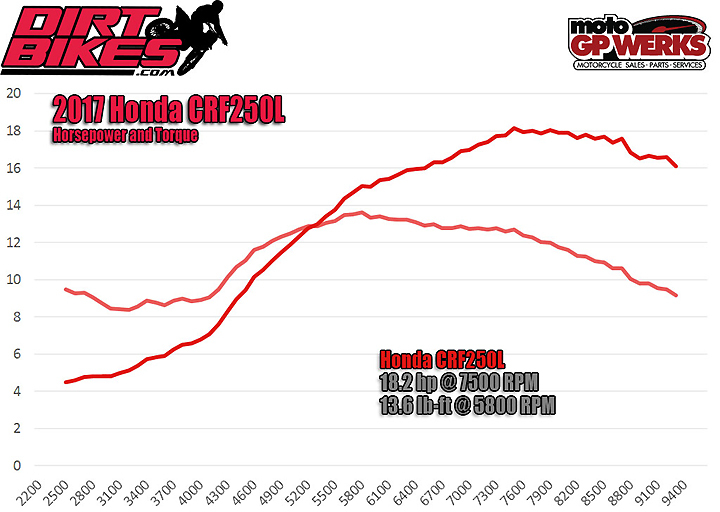 Honda haven't claimed a big increase, it's the kind of difference that would get lost in run-to-run variation. On that note, pulling the snorkel flattens the delivery slightly, hard to tell if it's for the better overall, in terms of torque / power. It's very boomy without the snorkel, not really a pleasing sound, unlike the grunty stock sound. Might try taking the side panel off instead. I'd also want to try removing the resonator on the inlet tube at some point. Pulling the O2 / lambda sensor just seems to make the bike less responsive down low - check engine light clears after a few ignition cycles / miles. Given the reduction in flow restriction in the exhaust and the intake I was a little disappointed to see that this narrow-band character remains from the previous model. Perhaps the picture will turn out to be different once people start throwing mods at it, or perhaps it's the fault of the head. Relatedly, going by part numbers, the inlet camshaft is a new item over any previous version of the engine, but the exhaust cam is out of the CBR300. There were some owners who claimed good gains with aftermarket cams but I felt that dcr stage 2 profile was a bad choice for my riding (tight singletrack). With all my mods (high comp piston, open airbox. cams, 13/44 gearing, full fmf exhaust, port head & dyno tune). The head porting alone yielded much more bang for the buck.